Air quality • Research indicates wood smoke is an ingredient in Wasatch Front's inversion soup. 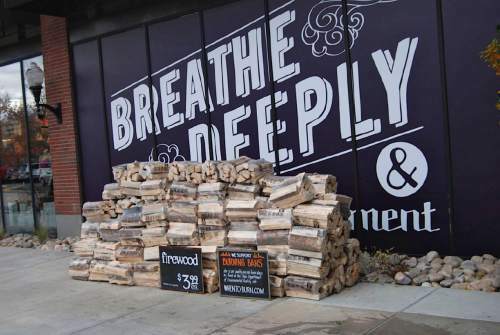 Brian Maffly | The Salt Lake Tribune Fire wood is sold all over the Wasatch Front, including at this Salt Lake City Whole Foods store whose decor celebrates healthy air quality. The Utah Department of Environmental Quality is fielding public comment on a proposed winter-long ban on wood burning. State air quality watchdogs want to hear from the public about a proposed winter-long ban on wood burning. In a series of meetings in seven northern Utah counties later this month, residents who love crackling wintertime fires and clean air alike will be able to sound off on the draft rule, an idea Gov. Gary Herbert first suggested a year ago. The governor believes blocking burning outright will reduce air pollution along the Wasatch Front. He first suggested the idea in his 2014 State of the State speech, calling on the Utah Air Quality Board to "limit" wood burning during the entire inversion season in pollution-plagued counties. "University of Utah research has shown wood smoke alone makes up approximately 5 percent of the particulates in our winter air and endangers public health," Herbert said. "We have learned that burning one log for an hour is equivalent to driving an automobile from Salt Lake City to St. George and back again." State air quality board members proposed the ban, which would run from Nov. 1 to March 15, at their December meeting. During two weeks of public hearings between Jan. 14 and Jan. 29, air quality regulators want to gauge public opinion of the idea. The rule might not apply to areas above 7,000 feet in elevation  including canyon communities and ski resorts. Restaurants and homes that rely on wood or coal for heat also would be exempted, but only if they are on the state&apos;s sole-source registry. The Division of Air Quality is re-opening the list for a six-month period starting Feb. 1 to accommodate homeowners who failed to sign up in the past. The first hearings are Jan. 14 in Tooele and Jan. 15 at the Department of Environmental Quality&apos;s Salt Lake City headquarters. Written comments will be accepted though Feb. 9. Wood burning already is restricted during the winter along the Wasatch Front and in Cache Valley, a region that is out of attainment for the federal standard for fine particulate matter, or PM 2.5. With green, yellow and red air quality days, burning is restricted in the state&apos;s population centers as inversions build and persist. This week for example, burning has been prohibited, even though particulate levels have remained below the federal threshold of 35 micrograms per cubic meter. State scientists says a full burn ban could knock nearly 2 micrograms off the Salt Lake Valley&apos;s worst PM 2.5 readings  about a 4 percent reduction. Modeling shows that change can be achieved if compliance with no-burn rules increases from 85 percent to 100 percent, according Dave McNeill, DAQ&apos;s planning manager. And air quality advocates hail the ban as a bold step toward cleaning up Utah&apos;s stubborn inversions, which trap fine particulate pollution near the ground. "It&apos;s one arrow in the of quiver of things we can do to improve air quality in Utah," said Rob DeBirk, campaign strategist with HEAL Utah. "Everyone wants to look out the window and be able to see the Oquirrhs or Point of the Mountain. This is one small step every person can take to make that a reality. It&apos;s not the only step." But the proposal also has drawn jeers. A full ban would punish those who have invested thousands of dollars upgrading their wood stoves to EPA-compliant models that burn more cleanly, according to Ed Red, a mechanical engineering professor at Brigham Young University. Red believes eliminating wood burning is not going to make a big difference in the Wasatch Front&apos;s air quality. Any policy changes, he added, must be based on sound data. "You need to consider this technically and not consider it as an emotional issue," said Red, speaking as a private citizen. "To come up with a blanket ordinance is not rational. I think it&apos;s politically motivated. I think the governor is making a serious mistake here." Meanwhile, the Salt Lake County Board of Health is expected to vote Friday on a proposal to toughen the current burning restriction. The county measure would ban burning on mildly polluted days when the state recommends only "voluntary action." Jan. 14 • Tooele County Health Department, 151 N. Main. St. Room 181, 4 p.m.
Jan. 15 • Utah Department of Environmental Quality, 195 N. 1950 West Room 1015, Salt Lake City, 6 p.m.
Jan. 20 • Bear River Health Department, 991 S. 800 West, Room B. Brigham City, 11:30 a.m.
Jan. 20 • Morgan Weber Health Department, 477 23rd St., Auditorium, Ogden, 5 p.m.
Jan. 21 • Logan Historic Courthouse, 199 N. Main St., Council Chambers, Logan, 4 p.m.
Jan. 28 • Davis County Administration Building, 61 S. Main St., Farmington, 10 a.m.
Jan. 29 • Utah County Health Department, 151 S. University Ave., Room 1600, 11 a.m.